Aim: Inflammatory and structural abnormalities of the airways are features of asthma, however their interrelationship is unclear. 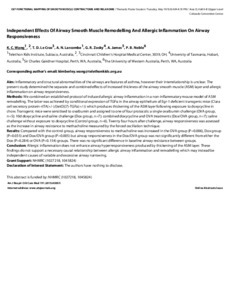 The present study determined the separate and combined effects of increased thickness of the airway smooth muscle (ASM) layer and allergic inflammation on airway responsiveness. Methods: We combined an established protocol of induced allergic airway inflammation in a non-inflammatory mouse model of ASM remodelling. The latter was achieved by conditional expression of TGFα in the airway epithelium of Egr-1 deficient transgenic mice (Clara cell secretory protein-rtTA(+/-)/[tetO](7)-TGFα(+/-)) which produces thickening of the ASM layer following exposure to doxycycline in chow. Transgenic mice were sensitised to ovalbumin and assigned to one of four protocols: a single ovalbumin challenge (OVA group, n=5); 10d doxycycline and saline challenge (Dox group, n=7); combined doxycycline and OVA treatments (Dox/OVA group, n=7); saline challenge without exposure to doxycycline (Control group, n=6). Twenty four hours after challenge, airway responsiveness was assessed as the increase in airway resistance to methacholine measured by the forced oscillation technique. Results: Compared with the control group, airway responsiveness to methacholine was increased in the OVA group (P=0.006), Dox group (P=0.035) and Dox/OVA group (P=0.005) but airway responsiveness in the Dox/OVA group was not significantly different from either the Dox (P=0.284) or OVA (P=0.154) groups. There was no significant difference in baseline airway resistance between groups.